Not to be confused with Colli Albani (Rome Metro). 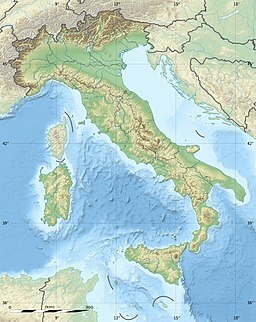 The Alban Hills (Italian Colli Albani) are the caldera remains of a quiescent volcanic complex in Italy, located 20 km (12 mi) southeast of Rome and about 24 km (15 mi) north of Anzio. The 950 m (3,120 ft) high Monte Cavo forms a highly visible peak the centre of the caldera, but the highest point is Maschio delle Faete approximately 2 km (1.2 mi) to the east of Cavo and 6 m (20 ft) taller. There are subsidiary calderas along the rim of the Alban Hills that contain the lakes Albano and Nemi. The hills are composed of peperino (lapis albanus), a variety of tuff that is useful for construction and provides a mineral-rich substrate for nearby vineyards. The hills, especially around the shores of the lakes, have been popular since prehistoric times. From the 9th to 7th century BC, there were numerous villages (see the legendary Alba Longa and Tusculum). The area was inhabited by the Latini during the 5th to 3rd centuries BC. The ancient Romans called the hill Albanus Mons. On the summit was the sanctuary of Jupiter Latiaris, in which the consuls celebrated the Feriae Latinae, and several generals celebrated victories here during times when they were not accorded regular triumphs in Rome. The foundations and some of the architectural fragments of the temple were still in existence until 1777, when they were used to build the Passionist monastery by Cardinal York, but the Via Triumphalis leading up to it can still be seen. In Roman times, the area was often used by the rich as a way to escape the heat and crowds of Rome, as it is today as shown by the many villas and country houses present. The towns and villages in the Alban Hills are known as the Castelli Romani. Examination of deposits have dated the four most recent eruptions to two temporal peaks, around 36,000 and 39,000 years ago. The area exhibits small localised earthquake swarms, bradyseism, and release of carbon dioxide and hydrogen sulfide into the atmosphere. The uplift and earthquake swarms have been interpreted as caused by a slowly growing spherical magma chamber 5-6 kilometres below the surface; some think that it may erupt again; if so, there is risk to Rome, which is only 25 to 30 km away. There is documentary evidence which may describe an eruption in 114 BC, but the absence of Holocene geological deposits has largely discredited it as a volcanic event and instead the account is considered to be a description of a forest fire. The volcano emits large amounts of carbon dioxide which can potentially reach lethal concentrations if it accumulates in depressions in the ground in the absence of wind. The asphyxiation of 29 cows in September 1999 prompted a detailed survey, which found that concentration of the gas at 1.5 m above the ground in a residential area on the northwestern flank sometimes exceeded the occupational health threshold of 0.5%. Eight sheep were killed in a similar incident in October 2001. One or more of the preceding sentences incorporates text from a publication now in the public domain: Chisholm, Hugh, ed. (1911). "Albanus Mons" . Encyclopædia Britannica. 1 (11th ed.). Cambridge University Press. p. 487. ^ Cecconi, Manuela; Scarapazzi, Maurizio; Viggiani, Giulia M. B. (2010). "On the geology and the geotechnical properties of pyroclastic flow deposits of the Colli Albani". Bulletin of Engineering Geology and the Environment. 69 (2): 185–206. doi:10.1007/s10064-009-0250-x. ^ a b Behncke, Boris (2003). "Italy's Volcanoes: The Cradle of Volcanology". Archived from the original on 13 February 2006. ^ Feuillet, N.; Nostro, C.; Chiarabba, C.; Cocco, M. (2004). "Coupling between earthquake swarms and volcanic unrest at the Alban Hills Volcano (central Italy) modeled through elastic stress transfer". Journal of Geophysical Research. 119 (B2): B02308.1-–B02308.16. Bibcode:2004JGRB..109.2308F. doi:10.1029/2003JB002419. ^ Carapezza, M. L.; Barberi, F.; Tarchini, L.; Ranaldi, M.; Ricci, T. (2010). "Volcanic hazards of the Colli Albani". In Funiciello, R.; Giordano, G. (eds.). The Colli Albani Volcano (PDF). Special Publications of IAVCEI #3. London: Geological Society. pp. 279–297. ^ Pizzino, L.; Galli, G; Mancini, C.; Quattrocchi, F.; Scarlato, P. (2002). "Natural Gas Hazard (CO2, 222Rn) within a Quiescent Volcanic Region and Its Relations with Seismotectonics: The Case of the Ciampino-Marino Area (Alban Hills Volcano, Italy)" (PDF). Natural Hazards. 27 (3): 257–287. doi:10.1023/a:1020398128649. ^ "Occupational Health Guideline for Carbon Dioxide" (PDF). National Institute for Occupational Safety and Health, United States Center for Disease Control. 1975. Archived (PDF) from the original on 7 June 2009. ^ Benson, Sally; Cook, Peter; et al. (2005). "Chapter 5: Underground geological storage". In Arbanades, Juan Carlos (ed.). IPCC Special Report on Carbon dioxide Capture and Storage (PDF). Cambridge, England: Cambridge University Press for the Intergovernmental Panel on Climate Change. pp. 195–276, page 249. ISBN 978-0-521-86643-9. Archived from the original (PDF) on 2 June 2006. citing Carapezza, M. L.; Badalamenti, B.; Cavarra, L.; Scalzo, A. (2003). "Gas hazard assessment in a densely inhabited area of Colli Albani Volcano (Cava dei Selci, Roma)". Journal of Volcanology and Geothermal Research. 123 (1/2): 81–94. Bibcode:2003JVGR..123...81C. doi:10.1016/S0377-0273(03)00029-5. Wikimedia Commons has media related to Alban Hills.